A book related workout with the BookTube Couple. Bookercise it! 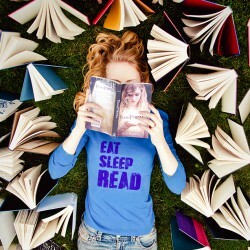 Thumbs up if you like this YA bookish-ness! *If you try the following workouts please be safe. *To bookercise (the book version of jazzercise) plant your feet firmly in the center of the books. Books may move out from one another and are not a stable ground for exercise. Bookercise with care.